Zuliani-Alvarez, L., Piccinini, A. M. and Midwood, K. S. (2017). Screening for Novel Endogenous Inflammatory Stimuli Using the Secreted Embryonic Alkaline Phosphatase NF-κB Reporter Assay. Bio-protocol 7(7): e2220. DOI: 10.21769/BioProtoc.2220. An immune response can be activated by pathogenic stimuli, as well as endogenous danger signals, triggering the activation of pattern recognition receptors and initiating signalling cascades that lead to inflammation. This method uses THP1-BlueTM cells, a human monocytic cell line which contains an embryonic alkaline phosphatase reporter gene allowing the detection of NF-κB-induced transcriptional activation. We validated this protocol by assessing NF-κB activation after stimulation of toll-like receptor 4 (TLR4) by two different agonists: lipopolysaccharide (LPS), derived from the cell wall of Gram negative bacteria, and tenascin-C, an extracellular matrix protein whose expression is induced upon tissue injury. We then used this protocol to screen for potential new endogenous TLR4 agonists, but this method can also be used as a quick, economical and reliable means to assay the activity of other inflammatory stimuli resulting in TLR-dependent NF-κB activation. The immune system has evolved to recognize not only pathogenic stimuli such as bacterial components and viral nucleic acids, but also endogenous danger signals including proteins secreted from necrotic cells or expressed upon tissue damage. Both types of stimuli are sensed by pattern recognition receptors, initiating signalling cascades that trigger inflammatory responses. Nuclear factor kappa-light-chain-enhancer of activated B cells (NF-κB) is a transcription factor essential for the activation of the immune response to infection and tissue damage. NF-κB has an important role in the expression of a wide range of inflammatory mediators following pattern recognition receptor activation, including cytokines (such as tumour necrosis factor α [TNFα], interleukin-6 and interleukin-1), chemokines (e.g., interleukin-8 or CXCL1), proteases, growth factors and MHC-related molecules, among others. To assess the activation of this pathway downstream of TLR4, we used the commercially available cell line THP1-BlueTM NF-κB (Invivogen). These cells are stably transfected with a construct containing a secreted embryonic alkaline phosphatase (SEAP) gene induced by the NF-κB transcription factor. The construct contains an interferon-β minimal promoter fused to five copies of the NF-κB consensus transcriptional response element and three copies of the c-Rel binding site, which drives the expression of the reporter gene. After cell stimulation with pathogenic or endogenous stimuli, NF-κB activation leads to the secretion of SEAP, which is then quantified using the colorimetric reagent QUANTI-BlueTM. This is a quick and reliable method to assess activation of NF-κB downstream of toll-like receptors, as the amount of SEAP in the media correlates with the triggering of this signalling pathway. However, this is an engineered cell line that does not express a full complement of inflammatory effector molecules (see Note 5), and so whilst useful in screening for NF-κB activation, data should always be confirmed in additional experimental systems, for example in primary macrophages, or in vivo. Thaw a vial containing 3-7 x 106 THP1-BlueTM NF-κB cells in a 37 °C water bath. Transfer cells to a 15 ml sterile tube containing 10 ml of pre-warmed ThP1 NF-κB medium without blasticidin (see Recipes). Centrifuge tube at 320 x g for 5 min. Remove supernatant and resuspend cells in 10 ml of ThP1 NF-κB medium without blasticidin. Count the cells using a hemocytometer. Transfer 1 x 106 cells in 10 ml of ThP1 NF-κB medium without blasticidin to a 75 cm2 cell culture flask and place the culture at 37 °C in 5% CO2. The cells grow in suspension. To passage the cells, transfer cells to a sterile 15 ml tube and measure cell concentration using a hemocytometer. Centrifuge tube at 320 x g for 5 min at room temperature, remove cell supernatant and resuspend cells in fresh media. Passage the cells every 3 days and do not let the cell concentration in the flask exceed 2 x 106 cells/ml. For the first two passages, cells should be cultured in medium without blasticidin to allow recovery from freezing. After the second passage, culture the cells in ThP1 NF-κB medium with blasticidin (see Recipes) to maintain selection pressure. Transfer cells to a 15 ml sterile tube. Centrifuge cells at 320 x g for 5 min. Remove supernatant and resuspend cells in new ThP1 NF-κB medium with blasticidin. Plate 1 x 105 cells per well in a flat-bottom 96 well plate in a final volume of 100 µl. 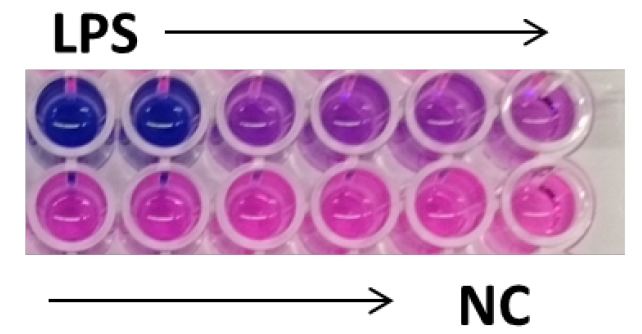 Immediately after plating, stimulate cells by adding LPS or recombinant protein (e.g., FBG) diluted in 100 µl of media in duplicate or triplicate wells. The final volume in each well is 200 µl. Incubate the cells for 24 h at 37 °C in 5% CO2 (see Note 3). To measure NF-κB-induced secreted alkaline phosphatase, collect cell supernatant. At this stage cells can be taken for assessment of viability for example by MTT assay. Warm QUANTI-BlueTM solution (see Recipes) at 37 °C for 10 min. Add 180 µl of QUANTI-BlueTM per well to a flat-bottom 96 well plate. Add 20 µl of THP1-BlueTM cell supernatant to each well. Incubate the plate at 37 °C for 2 h. The media will change color from pink to blue in the presence of secreted embryonic alkaline phosphatase (Figure 1). Determine SEAP levels by reading the optical density (OD) at 620 nm using a spectrophotometer plate reader. Figure 1. Detection of secreted embryonic alkaline phosphatase using QUANTI-BlueTM. Activation of THP1-BlueTM NF-κB cells with decreasing doses of LPS plus negative control (NC) performed in duplicates. In the presence of SEAP the QUANTI-BlueTM media changes color from pink to blue. The blue color intensity correlates with NF-κB activation at different doses. For each stimulus, plot the mean of OD values ± standard error of the mean (SEM), in the case of multiple independent experiments (Figure 2), or the mean of OD values ± standard deviation (SD), in the case of single experiments. The data can also be represented as fold change difference compared to non-stimulated cells. Perform statistical analysis using Graph Pad Prism or other software. Figure 2. NF-κB activation by LPS or the FBG domain of tenascin-C (FBG-C) in THP1-BlueTM NF-κB cells. Cells were stimulated with different doses of LPS or FBG-C or left unstimulated (-) and after 24 h NF-κB activation was measured using QUANTI-BlueTM. Data shown as mean ± SEM, N = 3 independent experiments. One-way ANOVA vs. non-stimulated with Dunnett’s post hoc test, *P < 0.05, **P < 0.01, ***P < 0.001. Statistical analysis was performed using Graph Pad Prism. QUANTI-BlueTM signal can be detected between 15 min to 24 h after adding cell supernatant. Determine the optimal time point for measuring QUANTI-BlueTM signal to be able to compare between independent experiments. THP1-BlueTM NF-κB cells respond robustly to TLR1/2, TLR2/6, TLR4, TLR5, TLR8, NOD1 and NOD2 agonists. 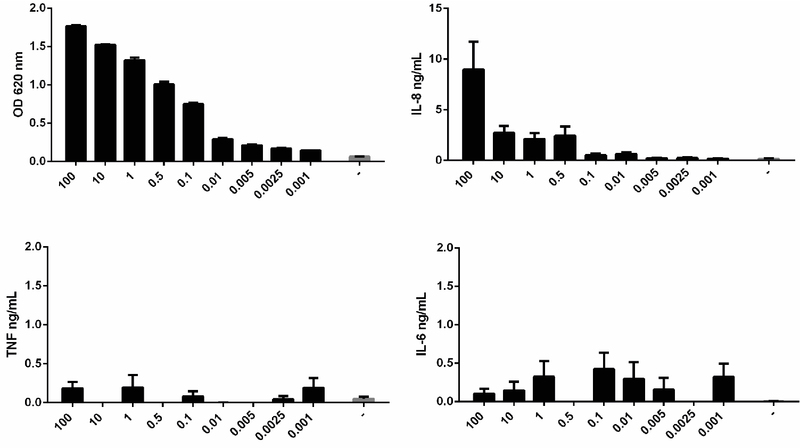 However, poor responses have been observed with TLR3, TLR7 and TLR9 ligands. Robust SEAP signal can be detected from 8 h after cell stimulation with TLR4 ligands (Figure 3). Nevertheless, it is recommended to titrate the stimulus of interest to determine the optimal dose and time point after stimulation to assess NF-κB activation. Figure 3. Time course of NF-κB activation in THP1-BlueTM NF-κB cells. Cells were stimulated with 1 ng/ml of LPS or 1 μM FBG-C and NF-κB activation was measured using QUANTI-BlueTM at different time points. Data shown as mean ± SEM, N = 3 independent experiments. One-way ANOVA vs. time 0 h with Dunnett’s post hoc test, *P < 0.05, **P < 0.01, ***P < 0.001. THP1-BlueTM NF-κB cells should not be used after the 12th passage (Figure 4). According to the manufacturer (Invivogen), these cells undertake genotypic changes that result in reduced responsiveness over time under normal culture conditions. It is important to prepare frozen stocks at early passages. Figure 4. Measurement of NF-κB activation in THP1-BlueTM NF-κB cells at different passages. Cells from different passages were stimulated with 0.5 ng/ml of LPS or left unstimulated (-) and NF-κB activation was measured after 24 h using QUANTI-BlueTM. Data shown as mean ± SEM, N = 3. Paired t-test vs. non-stimulated, *P < 0.05, **P < 0.01, ***P < 0.001. THP1-BlueTM NF-κB cells cannot be used to assess cytokine protein expression. No cytokines can be reliably detected in the supernatant of these cells after activation with LPS (Figure 5). Figure 5. THP1-BlueTM NF-κB cells do not express cytokines. Cells were stimulated with different doses of LPS or left unstimulated (-) and NF-κB activation was measured after 24 h using QUANTI-BlueTM; or cytokine synthesis (IL-8, TNF and IL-6) was measured by ELISA. Data shown as mean ± SD, N = 2 independent experiments. When testing the inflammatory activity of recombinant proteins, the LPS content of preparations should be < 10 pg/ml. Additional controls that should be included are 1) incubation of the recombinant protein with polymyxin B, an antibiotic that inhibits pathogenic activation of TLR4, but which doesn’t affect the recombinant protein activity; and 2) boiling the samples, which doesn’t affect LPS activity, but denatures the protein, destroying its pro-inflammatory activity (Figure 6). Figure 6. 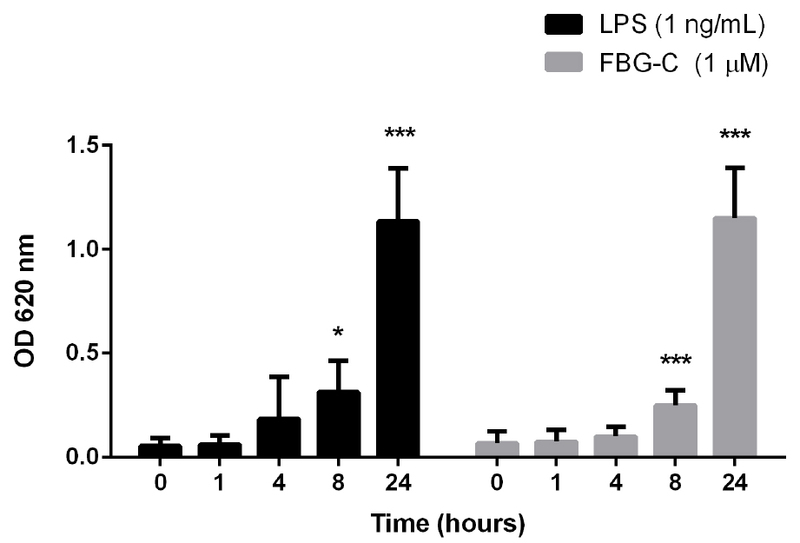 Effect of polymyxin B (PMB) and boiling on LPS and FBG-C activity in THP1-BlueTM NF-κB cells. 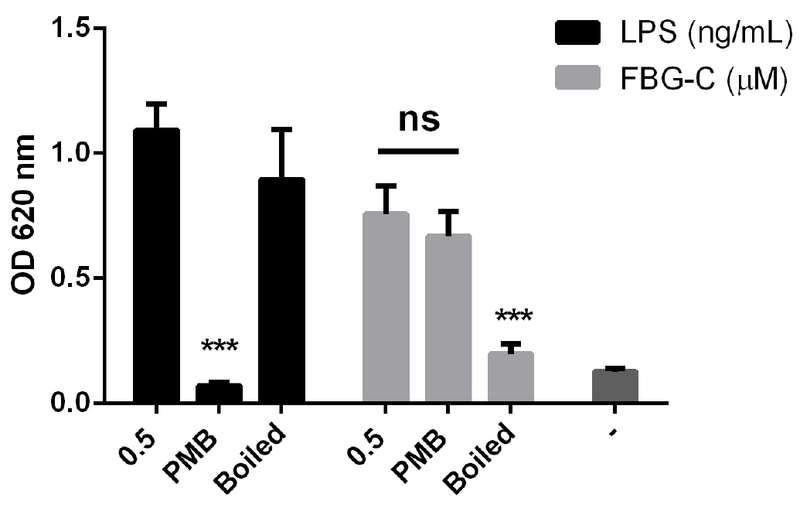 Cells were left unstimulated (-) or stimulated with LPS or FBG-C pre-incubated with PMB for 30 min or boiled for 15 min. NF-κB activation was measured using QUANTI-BlueTM. Data shown as mean ± SEM, N = 4 independent experiments. Paired t-test vs. non-treated, ***P < 0.001. We thank Anna Marzeda for providing the image used in Figure 1. This work was supported by funding from Arthritis Research UK and the Kennedy Trust for Rheumatology Research. This protocol was first published in Piccinini et al. (2016) and also features in the following manuscript currently under review (Zuliani-Alvarez et al., 2017). The authors declare that they have no conflicts of interest or competing interests that impacted the design and implementation of this protocol. Midwood, K., Sacre, S., Piccinini, A. M., Inglis, J., Trebaul, A., Chan, E., Drexler, S., Sofat, N., Kashiwagi, M., Orend, G., Brennan, F., and Foxwell, B. (2009). Tenascin-C is an endogenous activator of Toll-like receptor 4 that is essential for maintaining inflammation in arthritic joint disease. Nat Medi 15(7): 774-780. Piccinini, A. M., Zuliani-Alvarez, L., Lim, J. M. and Midwood, K. S. (2016). Distinct microenvironmental cues stimulate divergent TLR4-mediated signaling pathways in macrophages. Sci Signal 9(443): ra86. Zuliani-Alvarez, L. et al. (2017). Unravelling molecular determinants of danger: how tenascin-C is detected by toll-like receptor 4 (in review). How to cite: Zuliani-Alvarez, L., Piccinini, A. M. and Midwood, K. S. (2017). Screening for Novel Endogenous Inflammatory Stimuli Using the Secreted Embryonic Alkaline Phosphatase NF-κB Reporter Assay. Bio-protocol 7(7): e2220. DOI: 10.21769/BioProtoc.2220.